There is a special breed of people known as car enthusiasts. Their passion radiates with the mere mention of a particular vintage car or an exotic model. When enthusiasts become collectors, they desire a space to house their magnificent array. Part of the seduction of motorcars is admiring their pure beauty. Tracing the curves of a car with your mind’s eye becomes a reality when a man is surrounded in his trove of treasures. We recently had the privilege of designing and building a garage with living space for such a client. It is with passion and pleasure that we share this project with our customers, prospects and friends. We hope you enjoy reading this edition as much as we enjoyed developing the ultimate man cave. In the early stages, the direction given was straightforward: to create a unique garage/barn with living space to house a collection of cars maximizing the ability to store them indoors. The drawing board was blank at the onset and honestly; the collaboration process was as thrilling as getting behind the wheel of one of the sports cars! As the sketches began to take shape, a 3D rendering was created to be sure that the new structure was complimentary to the existing home. Once the design of the building was aesthetically pleasing and fitting on the property, the process of detailing the interior began. Because the garage was to become a showroom of beauty, the client requested no obstructions at all in the way of supporting posts. The open space was engineered as such and the center bay was designed for tandem parking with a car on either side allowing for four cars to be stationed on the main level. Additionally, a subterranean car lift allows parking of one vehicle to be underground so five cars can be parked in the building simultaneously. 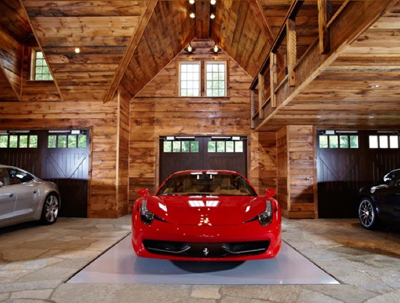 The garage floors, made of Laredo stone, which reside over radiant heating, were meticulously laid surrounding the platform of the lift so that the lift height was completely flush with the floor. The cars are properly illuminated to exhibit the high gloss paint and splendid appearance. Consideration was also given to the lighting on the lift. When a car is brought up from the lower level, the ceiling light is blocked allowing underside canopy lighting to illuminate the motorcar. The man cave is adorned with reclaimed rich chestnut wood used on the floors, railing posts, and 3 inch thick stair treads. The walls exude rustic charm and appeal as they are decorated with reclaimed white pine. Complimenting the handsome woodwork is a masculine stainless steel cable rail system which is seen both inside on the floating staircase, and around the lofted area, and outside leading down to the wine cellar. 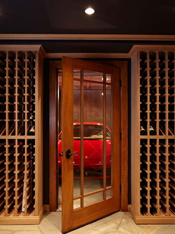 Guests can gather in a viewing room for wine tasting while gazing upon the subterranean vehicle on display. Some noticeable additions in the bay area are the electric charging station (for the Fisker), the custom soapstone utility sink embellished with an etched Ferrari emblem, and a full bathroom, kitchen and viewing area on the second level. The new garage is connected to the existing home with a magnificent outdoor living area. 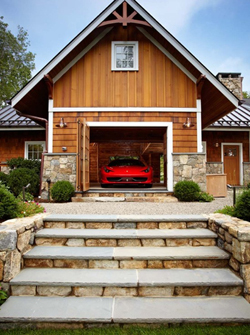 The stone fireplace on the exterior of the garage allows for a cozy gathering place outdoors complete with a pergola above connected to stone walls and greenery. This outdoor room extends to a small open patio, which then leads to a higher outdoor kitchen entertaining space on the main patio complete with pergola, rolling awnings to provide shade, LED down lights, sound system and ceiling fans. The retractable awnings have custom wind and rain sensors and will retract upon inclement weather. The outdoor kitchen is fully equipped with a sink, dishwasher, cooktop which includes a wok station, and grill. This project was truly a labor of love and we enjoyed the privilege of building it. We invite you to click here and view the extensive collection of photos on our website as it is a featured project. This beautiful piece can also be seen in our ad in East Coast Home Magazine. Thanks for reading and your continued support of TR Building & Remodeling! 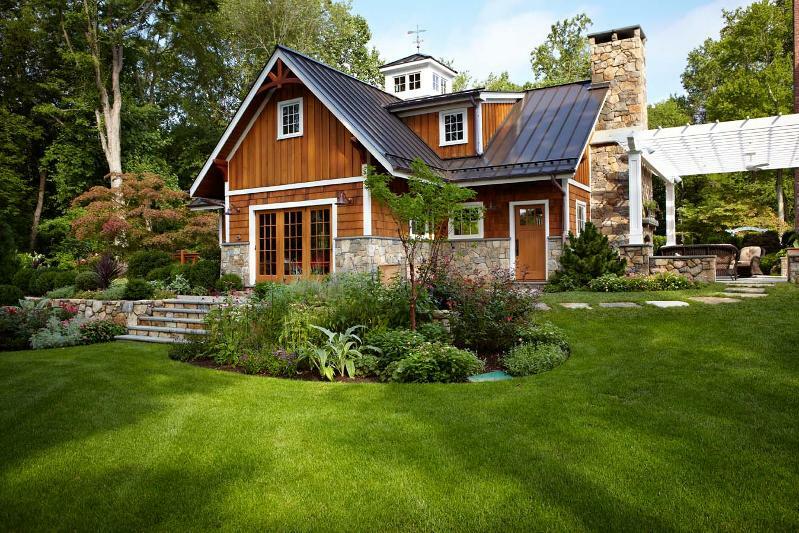 TR Building & Remodeling, Inc.